MXNet is faster: The 1.0.0 release includes implementation of cutting-edge features that optimize the performance of training and inference. Gradient compression enable users to train models up to five times faster by reducing communication bandwidth between compute nodes without loss in convergence rate or accuracy. For speech recognition acoustic modeling like the Alexa voice, this feature can reduce network bandwidth up to three orders of magnitude during training. With the support of NVIDIA Collective Communication Library (NCCL), users can train a model 20% faster on multi-GPU systems. 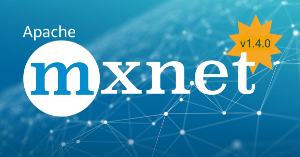 MXNet is easier to use: The 1.0.0 release includes an advanced indexing capability that enables users to perform matrix operations in a more intuitive manner. Advanced indexing for array operations in MXNet: It is now more intuitive for developers to leverage the powerful array operations in MXNet. They can use the advanced indexing capability by leveraging existing knowledge of Numpy/SciPy arrays. For example, it supports MXNet NDArray and Numpy ndarray as index, e.g. (a[mx.nd.array([1,2], dtype = ‘int32’).